This is the perfect all-season dress! Old Navy is always having great sales, so it’s easy to find deals on cute pieces. While scrolling through their website this week, I came across this adorable tie-neck dress on sale for $16. Nice, right? I love this dress because it comes in several different colors and prints, and is also available in tall and petite lengths. And – bonus – it’s not only super cute for fall, but could easily be worn year-round (depending on your climate). So pick it up while you can! For a classic college girl look, pair this dress with comfy fall staples. 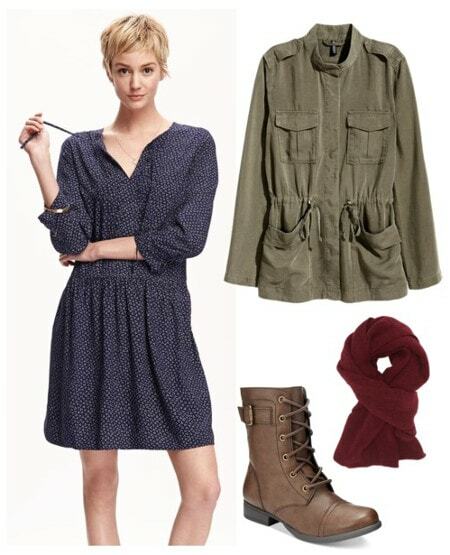 A utility jacket and combat boots add a casual vibe to this feminine dress. For a very fall-appropriate touch, layer up with a warm burgundy-hued scarf, too. This casual yet cute look would work for class, a coffee date, or weekend errands. Pair the dress with comfy flats for running around campus. A crossbody bag is an easy accessory to sling over your shoulder, ideal for carrying your essentials. And lastly, don’t forget a worn-in denim jacket to keep you warm against the chill air. For a fun ensemble, try styling this dress with structured fall pieces. A felt hat and belted vest add sophisticated polish to an otherwise casual swing dress. For a dressy, feminine touch, slip on a pair of ankle strap block heels to finish the look. Would you wear this dress? How would you style it for different situations? Let us know in the comments!